For the first time ever, scientists have found actual chemical evidence of water on a rocky object outside of our solar system. The water wasn’t found on a planet, but rather the remains of one shredded to bits by its dying parent star. Top illustration: Mark A. Garlick/space-art.co.uk/University of Warwick/University of Cambridge). The sopping wet object is orbiting the white dwarf star GD61 170 about 150 light years away. 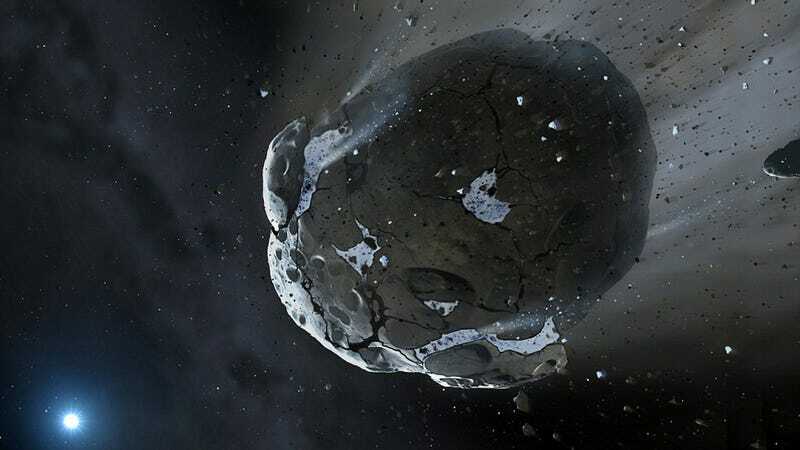 The chunk of rock, now technically an asteroid, came from a very small minor-planet measuring anywhere from about 56 miles (90 km) to 355 miles (570 km) across. In all likelihood, the minor-planet would have been comparable in size to Vesta, our solar system’s second largest asteroid (or second largest minor-planet depending on your persuasion — Ceres being the largest). Could giant asteroid Vesta actually be a planet? But 200 million years ago, its host star, GD61, entered into its death throes, engorging into a red giant, and then losing its outer layers of gases to expose its dense core, thus settling into its current white dwarf state. During this time, the water-rich minor planet was knocked out of its regular orbit and thrown into one so tight with its star that the gravitational forces caused it to break up. The resulting remnants are now orbiting the white dwarf — and they were recently detected by scientists using the Hubble Space Telescope and the large Keck telescope in Hawaii. More interesting than that, however, is the chemical makeup of the object. It has excess amounts of oxygen, an indication that the planet it came from must have been composed of 26% water by mass. That’s rather extreme when you consider that the Earth is composed of only 0.023% water by mass. To make this determination, the researchers used ultraviolet spectroscopy data drawn from the Cosmic Origins Spectrograph aboard Hubble. This is exciting news for astrobiologists who speculate about the potential for habitability and life on other planets. For the first time ever, astronomers have detected water on a terrestrial exoplanet — a former one at that. Prior to this discovery, we’ve only had evidence of water outside our solar system in the atmospheres of gas giants. What’s more, it’s proof that water can survive on planets long after they’ve been destroyed by their stars. Prior to this discovery, scientists have observed a dozen destroyed exoplanets orbiting white dwarfs — but this is the first time the signature of water has been found. Related: All stars have planets | Has the Earth seeded other planets? A Game-Changer in the Search for Alien Life: "All stars have planets"